In Mexico, the president is both the head of state and head of government, which means that a separate function of the Prime Minister does not exist. In fact, in Mexico, the president has even greater authorities than the president of the United States. On this day in 1966, Mexico`s President Enrique Peña Nieto was born. He was elected in 2012 for a term of six years (Mexico has a long presidential term). He was born in the city of Atlacomulco in the central part of Mexico, approximately 80 kilometers from the capital. He came from a family involved in local politics. Enrique Peña Nieto entered politics in a fairly young age, after graduation. At the age of 35, he became governor of the State of Mexico (Estado de México), which is located near the capital and has over 16 million inhabitants (the most populous of all the Mexican states). As governor, he pledged to keep as many as 608 promises, which he signed in front of a notary. According to the reports of his party, he fulfilled almost all of them, which the opposition, of course, is trying to put in question. In 2012, Enrique Peña Nieto was elected the Mexican president. It is a powerful function, because Mexico has a presidential political system (somewhat similar to the U.S., rather than European countries with parliamentary systems). Specifically, in Mexico, the president is both the head of state and head of government, which means that a separate function of the Prime Minister does not exist. In fact, Mexican president has even greater authorities than the president in the United States. 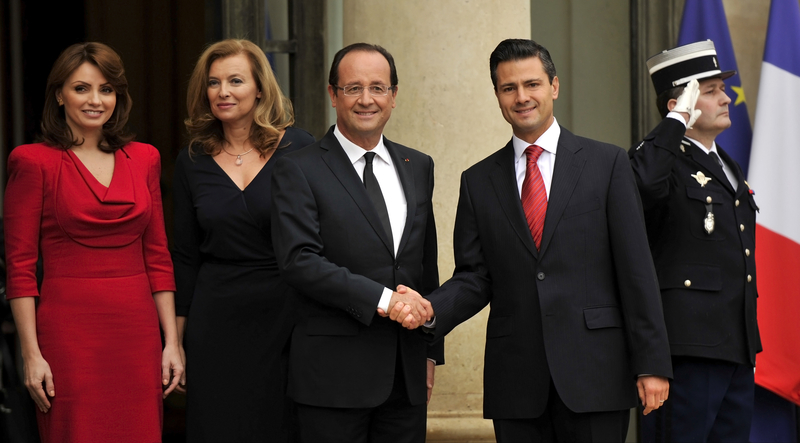 After his first wife died, Enrique Peña Nieto married the famous Mexican telenovela actress. Her name is Angélica Rivera and she is about three years younger than him. She starred in many telenovelas, including Mariana de la Noche (Dark Fate) and Destilando Amor (Distilling Love).